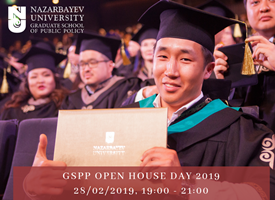 Graduate School of Public Policy (GSPP), Nazarbayev University invites you to take part in the Open House Day on Thursday, 28 February 2019. An Open House Day is a great opportunity to hear from GSPP students and academics over a cup of coffee, explore the campus, and gain an insight into what it’s like to be a GSPP student. Come and find out why and how you will benefit from a graduate education in public policy / public administration! Date: Thursday, 28 February at 7 PM. Venue: Nazarbayev University, Block C3, 1st floor, room 1.010. The School maintains a strong partnership with the Lee Kuan Yew School of Public Policy, National University of Singapore, one of Asia’s leading educational institutions. Programs are delivered in English. GSPP provides state grants covering tuition fees and monthly allowances based on academic performance. The Graduate School of Public Policy (GSPP) offers – Master in Public Policy (MPP), Master in Public Administration (MPA) and Ph.D. in Public Policy programs. We kindly ask to share this information with your friends, colleagues, and all interested/potential candidates. Please follow the link to confirm your attendance.